Marker Text: This Square, which was laid out in 1733, was originally named for John Percival, Earl of Egmont, who played a large part in founding the colony of Georgia. Its name was changed around 1763 to Wright Square in honor of James Wright, royal governor of the province of Georgia (1760-1782). In the Town Hall which was located on the present site of the Chatham County courthouse, George Whitefield, Church of England minister at Savannah, preached to large congregations in early colonial days. 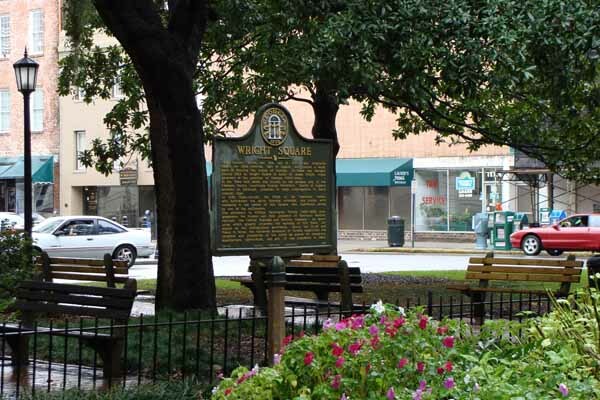 In 1739 Tomo-chi-chi, the Chief of the Yamacraw Indians who befriended the early Georgia colonists, was buried with ceremony in the center of this Square. Gen. Oglethorpe acting as one of the pallbearers. The monument to William Washington Gordon (1796-1842) commemorates the founder and first president of Georgia’s earliest railroad, the Central Railroad and Banking Company — an enterprise which greatl promoted the economy of this State. Designed by the distinguished architects, Henry Van Brunt and Frank M. Howe, the handsome monument to Gordon symbolizes the progress and prosperity of the world by means of commerce, manufacture, agriculture, and art. It was completed in 1883.